Take advantage of a $80 savings when you sign up with a single pay today. The regular price is $479 for a half acre sized lot, but if you take advantage today your price will be $399. Don't worry if you have a larger lot, we will apply the deer repellent for just $79 extra per gallon. 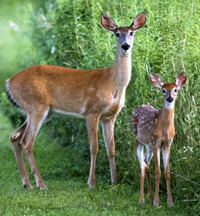 Our single pay option renews in 12 months to keep you yard safe from deer each winter/spring. And if you decide after this winter that the service is not for you, we have a simple cancellation policy.